Do you love Techmeme news and wish you could get the latest news as notifications on your Android Wear device? Then this app is for you! We are pleased to announce the release of LIFTTT for both iPhone and Android devices. We like to describe LIFTTT as Location + IFTTT = AWESOME If you love IFTTT and you love magical things to happen based on your current location, then LIFTTT is the app for you! With LIFTTT, you can add your favorite places and specify what type of IFTTT recipe you would like to trigger while maintaining total control of so many different settings & customization options. We are happy to announce the release of Uber Checkin 4.0.5 for Android. This release has a few minor bug fixes on the back of our major release (Uber Checkin 4.0) for Android which brought significant enhancements to battery and location. We hope you enjoy and of course hope you had a great Thanksgiving! We are pleased to announce the release of our latest app Uber Mayor — now available for your iPhone! Uber Mayor is the Ultimate tool for would be Foursquare Mayors and provides Rich Mayorship Analytics at your fingertips! And much much more! Checkout the Uber Mayor page for more information! And of course Uber Mayor is free and available worldwide! We are proud to announce the release of an update for Uber Checkin for Android. We are pleased to announce that the latest update for Uber Checkin (v1.2) for iOS is now available for download via iTunes App Store. 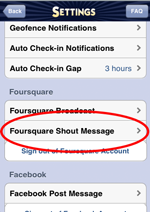 With this update, you can now customize the foursquare shout message upon upgrade. It was really good to read the nice things aboutfoursquare.com have said about our app and it is always very rewarding to hear that our efforts have been appreciated. We are pleased to announce the release of Uber Checkin for the Android. Uber Checkin for Android offers you the same great Foursquare auto check-in functionality for Android devices. 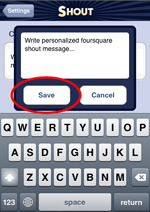 Auto checkin to your favorite places on Foursquare without having to take out your phone. Avoid checkin fatigue! Avoid false positive checkins! 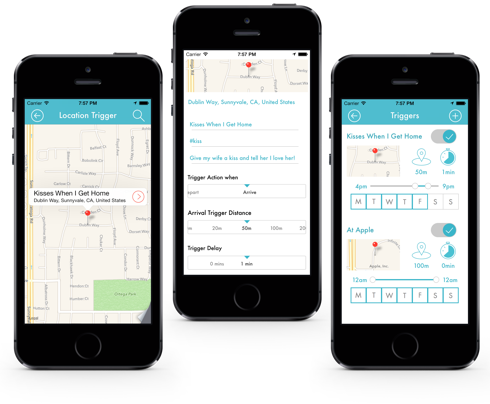 Customize your auto checkin proximity distance to suit your needs. Uber Checkin will notify you when you have become mayor of a foursquare venue, when you are “Almost Mayor” as well as providing your Mayorships total! We have worked painstakingly hard to have Uber Checkin conserve your battery life. As always, if you have any comments or feedback, we would appreciate you contacting us directly *first* before posting a negative review. We are pleased to announce the release of Uber Checkin for iPhone, our location based auto checkin app for Foursquare and Facebook. Uber Checkin is a best of breed, extensively customizable app that has been rigorously battle tested in condensed urban as well as spacious rural environments. 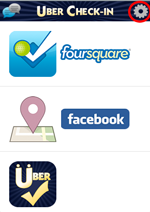 Auto checkin to your favorite places on Foursquare or Facebook without having to take out your phone. Avoid checkin fatigue! 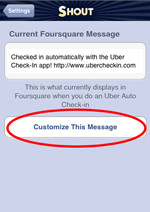 Customize your notification level: you can even be aware of geofence triggers to know that Uber Checkin is working! Or you can mute notifications completely. Check your total mayorships in the Uber Checkin mayorships screen! And of course we have worked painstakingly hard to have Uber Checkin conserve your battery life. We are quite proud of Uber Checkin and and hope you find it as useful and enjoyable as we do! If you have any comments or feedback, we would appreciate you emailing us directly *first* before posting a negative review.